Washington State is known for many things—Seattle, the Space Needle, mountains, evergreens and rain in the winter. But don’t mistake that rain in the winter as a reason not to take a little vacation. Whether you live in the Evergreen State or are visiting from elsewhere, Washington’s winters are a great time to explore. Western Washington stays mostly temperate. Sure, it’s a little rainy, but don’t let that stop you from enjoying yourself. Central and Eastern Washington do get cold and get a fair amount of snow, but that’s perfect for ski vacations or visiting the wintery wonderlands that are some of the state’s quaint mountain towns. And, sure, you can make just about any place in Washington a winter vacation. You could head to the coast, but expect bitter winds and driving rains many days. You could choose to explore a national park, but you’ll need to factor in chains and road closures and limited visibility. Some places just beg to be visited in warmer months. Bust out your winter coats, your rain jackets and your boots. Here are the best winter vacation destinations in Washington State. And if you're looking at the wider Northwest, also check out winter destinations in Oregon. Leavenworth tops the list for a reason. It’s adorable any time of year, including winter. The German-themed town is a great place to stay with its Bavarian appeal (even the gas station in town looks like it’s right out of the Bavarian Alps). While it’s not large, you can easily enjoy a shorter vacation right on its main street—shop, have some German beer and food, or catch a theater performance. 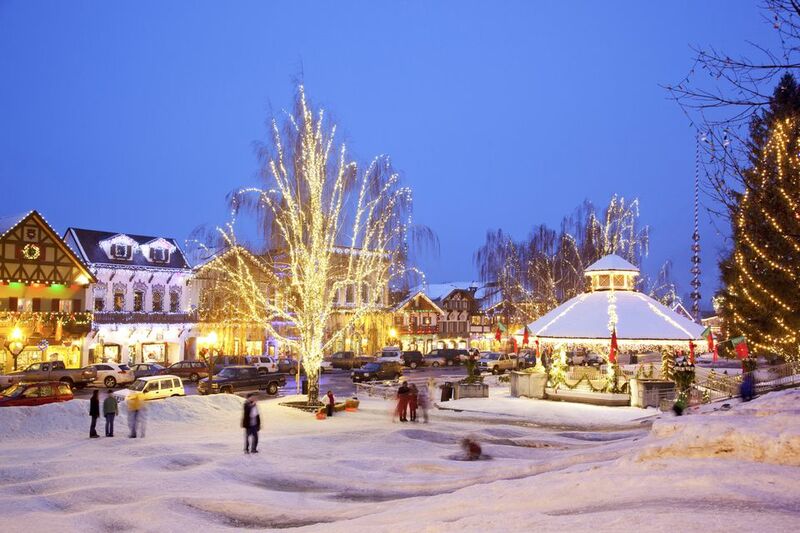 But you’re missing out if you center yourself only in Leavenworth as this town is best when it’s used as a base for the surrounding winter paradise as it’s perched next to ski resorts, trails perfect for snowshoeing or snowmobiling, and even a Reindeer farm. Stevens Pass Ski Resort, the Leavenworth Ski Hill and Mission Ridge Ski Resort are all easy to get to. Always check the town events calendar to see what’s happening. You might catch an alp horn performance! For where to stay, you can customize your experience as well. There are a number of hotels right in Leavenworth, ideal if you want to taste test your way through as many German beers as possible. For somewhere quieter, there are a number of resorts just on the outskirts, including the lovely Sleeping Lady Resort where you’ll find an upscale buffet (seriously, it’s delicious), quiet cabins, artwork and an absolutely relaxing atmosphere. For a resort experience, Suncadia Resort just off I-90 is a stellar winter destination with trails where you can go cross-country skiing or snowshoeing right on the property—or take advantage of a tubing hill, an ice skating rink, sleigh rides and more. If you’re more of an indoor person, curl up by the fireplace in your room, spend some time at the spa or onsite restaurants, or spend some time at the indoor pool. Suncadia also makes a great base for a wider ski vacation as the Summit at Snoqualmie is not far away. Another mountain lodge that makes a spectacular winter vacation base is Sun Mountain Lodge. The nearby Methow Valley and surrounding Okanogan Country are pretty sweet any time of year, but in the winter they transform. Surrounding the lodge are hundreds of miles of trails to go cross-country skiing and snowshoeing, as well as tubing hills, places to go sledding, sno-parks and places to go ice skating. If that’s not exciting enough for you, you can even go heli-skiing in the also nearby North Cascades. When you’re ready to relax for the evening, relax in the coziness of your room. Seattle is a strong vacation destination any time of year, and winter is no exception. Washington’s largest city makes a great winter destination because you’re unlikely to find harsh weather and snow (though, be warned, you will very likely to get rained on and, if it does snow, the city pretty much shuts down). While some attractions might not be as enjoyable in the winter weather (views from the Space Needle will be less spectacular if the weather isn’t clear), plenty of things to do are fun either way. Sip on a latte in one of the city's many coffee shops. Stroll through the Seattle Art Museum or explore the Pacific Science Center. Go see a show at the 5th Avenue or Paramount, or enjoy dinner at one of Seattle’s nicer restaurants while you get to know why Northwest cuisine is something not to miss. If you don’t mind bringing along a raincoat or a hat, Seattle’s temperate climate means that hiking in Discovery Park or taking a ferry ride aren’t off limits either. In fact, the moody appeal of the Puget Sound in winter can have charm all its own. Just across Lake Washington from Seattle, Bellevue makes a fair winter vacation destination for one reason—you can stay at the Hyatt Regency and never have to go outside at all. If what you seek is some retail therapy, this is the vacation for you. The Hyatt is connected by way of indoor passageways and sky bridges to not one, but the three different shopping centers that make up the Bellevue Collection, including Bellevue Square that has hundreds of stores all on its own. You can literally shop till you drop without ever going out into the elements. A waterpark might not be what first comes to mind for a winter vacation, but why not? Great Wolf Lodge in Grand Mound, Washington, has an entirely indoor waterpark that can be the perfect way to pretend like winter is just not happening. For one, there’s the waterpark complete with slides, rides, pools and hot springs. There are also lots of other ways to keep the littles entertained—buy a wand and go on a quest throughout the resort, play mini golf or spend some time in the arcade. For grown-ups, there’s a spa and a few nicer dining options, too. Aside from pairing one of the great Northwest lodges with a nearby ski area, any and all of Washington’s ski areas make strong contenders for winter vacation destinations. Some, like the Summit at Snoqualmie or Crystal Mountain, are close to Seattle and other Western Washington cities. Stay at a hotel near the ski areas or add a ski day or two as an aside to a Seattle vacataion. Others, like 49 Degrees North, are a little more remote and more ideal to be the focal point of a vacation all on their own. But if cold weather means snow and whipping down a mountainside to you, then Washington’s biggest ski resorts are for you.